URGENT Help Needed!!! Can anyone provide temporary foster care for Monte the cat? Earlier this year we welcomed Blue (the dog), Monte (the cat), and their family to Ruff Riders. At the time, they lived in an apartment in Bed-Stuy, Brooklyn. Rodney was unemployed, so we shared dog food and supplies to help make ends meet. Fast forward, to when life got even more complicated…. The family was finally approved for subsidized housing (“Section 8 Housing”) and a unit opened up in a Brooklyn apartment building. They were scheduled to move in August 1st, so they relinquished their old apartment. The subsidized apartment didn’t pass its Section 8 inspection, so the landlord needs to make repairs to the unit — and then it needs to be reinspected and pass — before they can move in. The familty is temporarily homeless and staying in a shelter in the Bronx. A family friend took in Blue (the dog) temporarily, but they haven’t found anyone to take in Monte. The homeless shelter does not allow pets. Last week when they were moving out of old apartment, Monte bolted and they couldn’t find him. 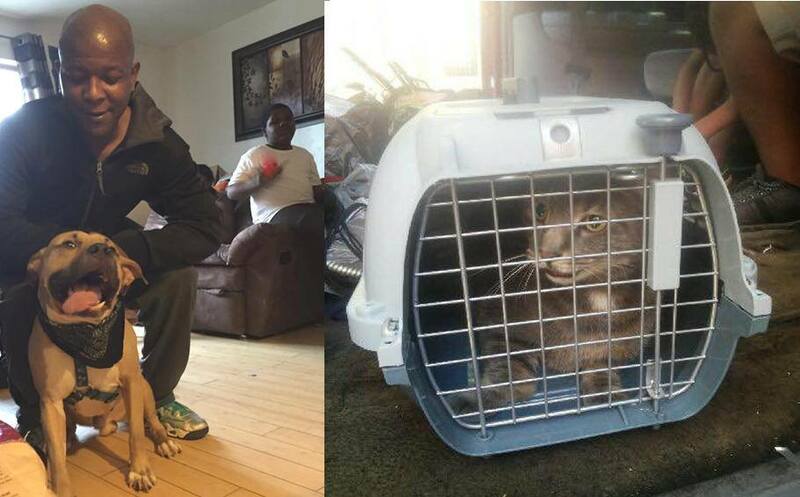 They’d been looking for him — traveling all the way from the homeless shelter in the Bronx to their old apartment in Brooklyn, which more than an hour away without traffic — and today they finally found him. But Monte can’t come to the shelter tonight; he needs a place to go. The family has a car — and that’s where they are right now — but they can’t sleep in it. Why not? It’s too hot (90+ degrees today!) and it’s not safe, especially for the children. And if the car got towed, they’d have to pay hundreds of dollars to get it back. Not a practicle plan for this family. So, can anyone provide temporary care for Monte until the family moves into their new apartment? This would likely be in September, although it’s possible this could take longer, depending on how quickly the landlord completes repairs. Monte is 5 years old and neutered. His last vaccinations were in 2009, but Ruff Riders can help get him up-to-date on those. Monte has lived with dogs (Blue!) and with children. He hasn’t lived with other cats, so we don’t know how he’d be around them. The family is willing to drive Monte to you, if you live in the NYC area. We’re looking for a foster home that is compassionate, flexible, responsible, and understands that the goal is to reunite Monte with his family. If you are that person, please contact us at kim@beyondbreed.com. UPDATE! We asked, you answered…and Monte the cat now has a place to stay! Our partners at Brooklyn Cares Veterinary Hospital and Dental Clinic are taking care of Monte for a week and then he’ll be heading to a foster home in Bed-Stuy, Brooklyn. When we called Monte’s family to share the news, they were in the lobby of the animal control shelter, about to surrender Monte because they had run out of options. Brooklyn Cares reports that Monte is “a very, very sweet cat” and he’s adjusting well to his temporary home-away-from-home. THANK YOU all for sharing this family’s story, and special thanks to Brooklyn Cares and Monte’s foster family for opening your hearts to a Ruff Riders family in crisis. We love you! While the family (including their children) have to spend the next month in a homeless shelter, at least they don’t have to lose their family pets on top of everything else.